When it comes to colour and style, many brides choose to inject a little personality into their wedding ceremonies by selecting striking floral arrangements. Last month’s Chelsea Flower Show in London served as floral inspirations for many to-be brides across the world. This year’s spectacular gardens took inspiration from a number of sources, with the Kingdom of Thailand’s entry represented by the Nong Nooch Tropical Botanical Garden. The display featured a kaleidoscope of exotic Asian flora and fauna, including a pair of white peacocks crafted from flowers. 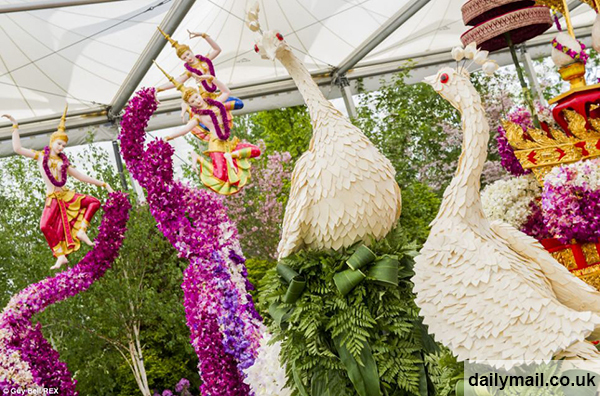 The Thailand Garden required more than 100,000 blooms to create. In Thailand, the country’s monarchy is an important part of the culture, and the Royal Family are extremely respected within Thai society. The white and yellow orchids used in the display were intended to reflect King Rama IX’s influence on Thai culture and religion. Other popular displays at the show included a recreation of a World War One trench which featured colourful paintings and a poppy fountain. However, a traditional British country garden display earned designer Hugo Bugg the top prize at the show. “The RHS Chelsea Flower Show stands for the highest levels of horticultural excellence, and the exhibitors this year have demonstrated their incredible knowledge and ability with their fantastic exhibits,” said Alex Denham, the RHS head of shows development. It is no wonder then that brides across the world have been looking to colourful images of the Chelsea Flower Show for inspiration on the latest horticultural trends to roll out on their wedding days. This year, romantic floral displays with a twist of effortless vintage chic dominate what is in vogue. By incorporating a few natural rustic elements into their flower displays, brides can look forward to a dreamy wedding that remains close to nature. When it comes to bouquets, larger arrangements can tell a story of their own, and are a nifty way of highlighting the bride’s gown. As such, many brides are opting for draping or flowing arrangements as opposed to traditional tight, round bouquets. In terms of décor, flowers can help set the evolving tones during the course of the celebrations, from the dreamy ceremony to the vibrant post-dinner disco. Couples seeking to emulate Nong Nooch’s Chelsea Flower Show display with an extra Thai flourish may enjoy marking each guest’s place setting with a miniature orchid. A small plant placed next to a miniature chalk board setting displaying the guest’s name will also add a down-to-earth, rustic touch. Orchids also make for beautiful wedding lapel pins for the groom and his groomsmen, as well as exquisite floral hair pieces for the bride. Best of all, these versatile plants come in all colours of the rainbow, allowing for them to be easily incorporated into the palette scheme of the wedding.